The colossal and dramatic Mehrangarh Fort – which rises 400 sq ft above the city – looks nothing less than a formation out of a fairy tale. The imprint of Jodhpur’s erstwhile royal family, built by Maharaja Jaswant Singh in the 17th century, it is the defining feature of this otherwise low-rise landscape. If you aren’t visiting Jodhpur in winter, make sure you reach the fort early to skip the midday heat that’s pretty energy consuming. You don’t really need a ticket to enter the fort itself; only the museum section. Mehrangarh Fort is packed with history and houses one of the best-kept collections of regal paraphernalia in the country. What you see is a magnificent collection of silver elephant howdahs, gilded palanquins, carved ivory, weapons inlaid with gold and jewels, rare pieces of textile, and some of the world’s finest miniature paintings. 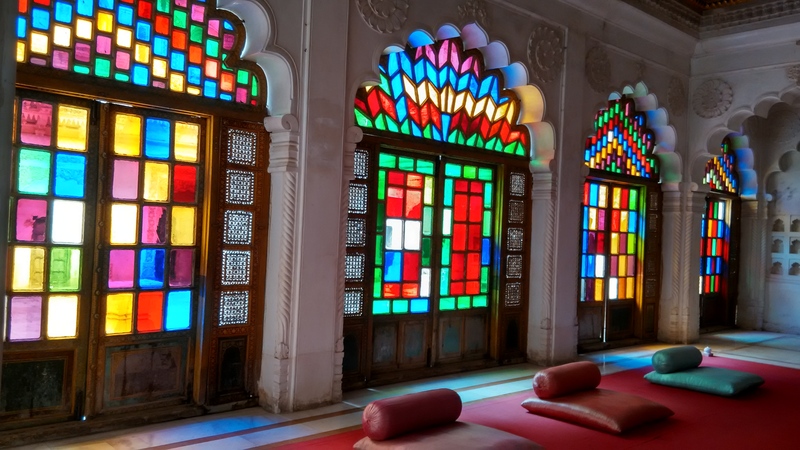 You’ll be amazed to see the elaborate cradles of infant princes and extensive zenana (where maharanis lived) with dainty filigree windows. 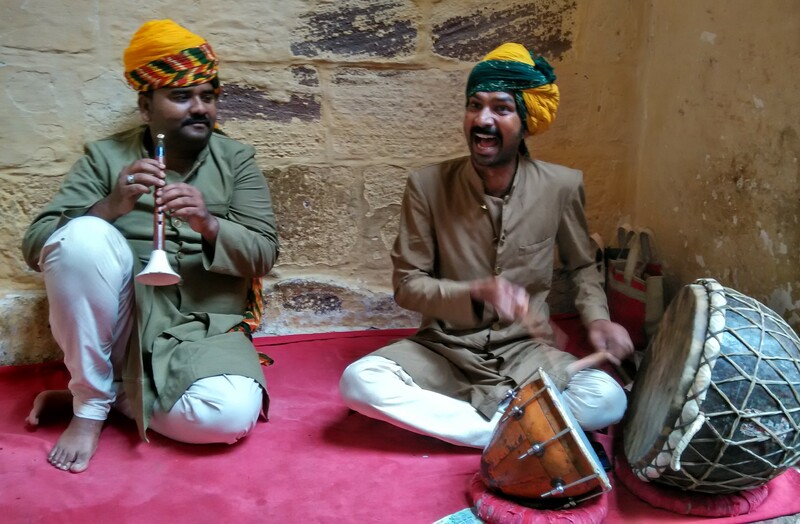 So, be sure to hire a guide to take you through the palatial labyrinth, great hallways and long corridors while narrating the stories about the heroism of the legendary Rajput warriors of Marwar. 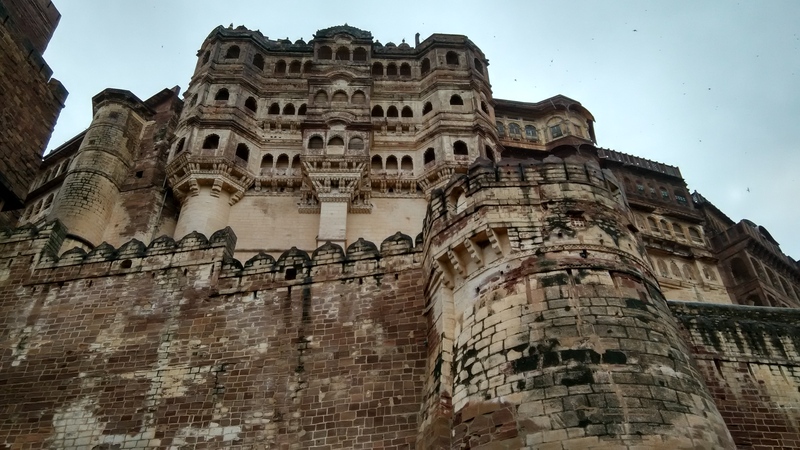 I visited Mehrangarh during monsoons (not an ideal time to be here though!) and was lucky enough to catch these men performing live. Their music transformed the spirit of the place. Truly an ethereal experience! You can also consider spending the afternoon at its small cafe sipping chilled beer or wine, lounge under shady trees reading a book or simply enjoy the spectacular views of the romantic city (Yes, this fort guarantees the best view!). There are some curio shops too; you can take back valuable merchandise like a Jodhpuri earring or maharaja pen as memory. For the adventurer in you, there’s the flying fox zip-line tour, which runs underneath the fort (activities are shut during monsoons). Built by Raja Sur Singh, Moti Mahal (Pearl Palace) is the largest period room of the Mehrangarh Museum. The king used to sit here on his throne and meet all his subjects. 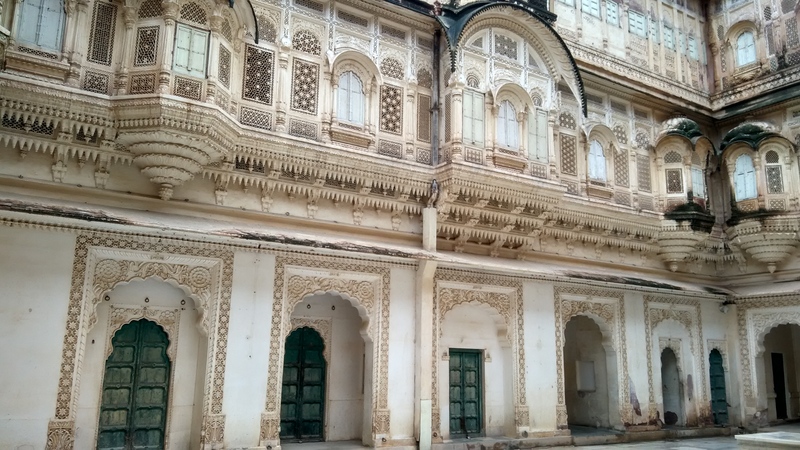 The Moti Mahal has five alcoves leading to hidden balconies that were built for the five queens of the Maharaja to enable them to listen in on court proceedings. When in Jodhpur, a visit to Umaid Bhavan is a must. If your budget doesn’t permit you to stay there, go for dinner or drinks at its scenic restaurant where the verandah offers a lavish view of the palace gardens. Think indulging in some Rajasthani delicacies (ker sangri and laal maas) generously spread on silver platters. Non-guests aren’t admitted during all seasons; so it’s worth calling in advance to make a reservation. 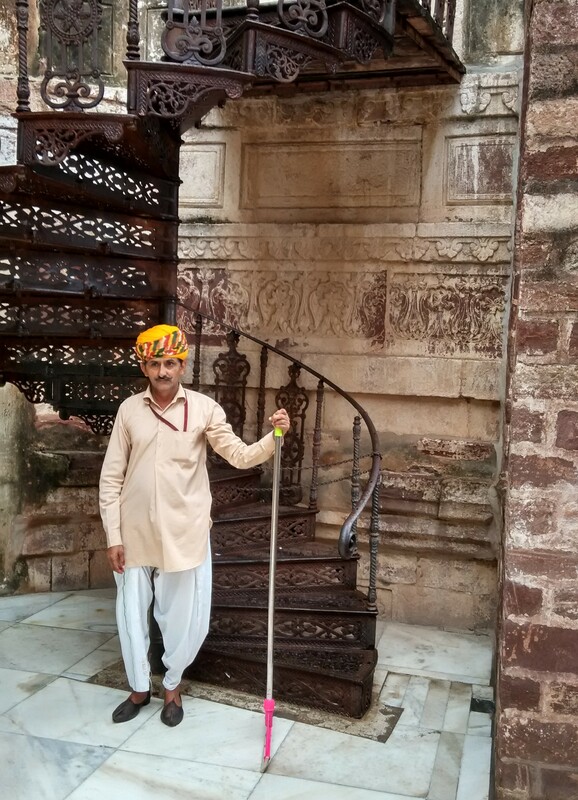 Again, casual visitors aren’t allowed inside the palace as the current royal bearer Gaj Singh II still lives here. But you can certainly visit the museum by paying a nominal entry free. Pictures of artistic palace interiors, eccentric collection of elaborate clocks and maharaja’s vintage cars are eye-catching. You find yourself going back repeatedly to the market around the Ghanta Ghar. Though its loud, dusty and a tad filthy, the bylanes sell wares, spices, metal bangles, Jodhpuri jootis, Rajasthani turbans, and loads of mithais and snacky items you can munch on when on a shopping spree. The area somehow creates an aura that is hard to resist. What the city is popularly known for is its antique furnitrure emporiums. There are a few near Ghanta Ghar too. It you’re someone who loves investing in retro, unique home decor pieces and pretty furnishings in Indian prints, it’s impossible for you to leave a store empty-handed. From coloured-glass lanterns and vintage posters to jaali-work wooden frame and quirky painted metal trunks, you’ll find it all. Remember to make the most of your bargaining skills! As a souvenir, you can pick a signature Jodhpuri reversible block-print quilt that is known to have a cooling effect during the summers and heating effect during harsh winters. Have some serious shopping on mind? Make sure you separately allot a day for it so that you do not need to make your choices in a hurry! 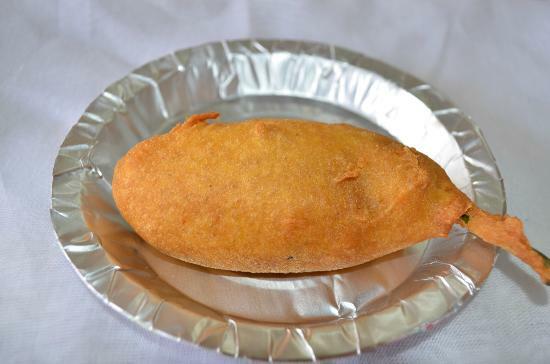 Your trip would be incomplete if you leave without sampling Jodhpur’s fiery mirchiwadas (king-size green chilli stuffed with spicy potato filling, dipped in gram flour batter and fried), kachoris and makhaniya lassi. The busy area around the Clock Tower market has a number of street stalls offering freshly-fried versions of the eatables. Try Janta Sweet Home at Nai Sarak which is a favourite among the locals for its sweets and namkeens. Jodhpur is well-connected by railway – trains to Jaipur, Delhi, Mumbai, Chennai and Kolkata operate on a regular basis. The city is accessible by air too. Jet Airways and Indian Airlines both fly daily to Delhi and Mumbai, with Indian Airlines’ Mumbai flights stopping at Udaipur on the way. Jodhpur airport is merely 5 km from the city center making air travel all the more convenient. October to December is the ideal time to visit Jodhpur when the weather is neither extremely chilly nor unbearably hot.